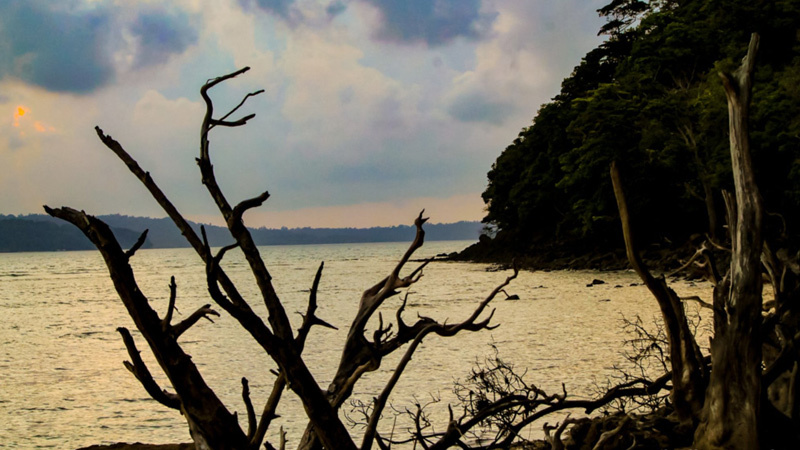 Chidiya Tapu has often been referred to as Andaman’s best sunset beach. Chidiya Tapu is alternately famous as “Sunset Point” and also “Bird Island”. The beach point is located at the southern end of the Andaman Island and takes approximately 45 minutes to reach from Port Blair. The peaceful and very green mangrove forest that fringes the boundaries is home to as astonishing 46 varieties of endemic birds. The best season to visit Chidiya Tapu is from October to May. A forest guesthouse is located at the tip of a small hill and offers exotic view of the islands and beach around. A short boat trip from Chidiya Tapu to Cinque Island can also be very interesting. The main attractions of this place are the Chidiya Tapu Biological Park, Chidiya Tapu Beach, Sylvan Sands and Munda Pahar beaches. The sea shell lovers find this place heavenly due to the brilliant collection of colourful sea shells strew along are the prime attractions. The beaches are a paradise for collectors of sea shells because different varieties of vibrant shells lie strewn all around. Reach the sunset point of Chidiya Tapu a bit earlier than the actual sunset because the best views are available at least half an hour before the sun vanishes down the horizon. The last rays and the hues are obstructed by the hills of Rutland Island situated across the bay.